Ride To Give requests some further information. 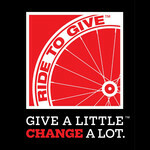 Ride To Give issues a tax receipt to individuals. Ride To Give issues a tax receipt to individuals. Ride To Give does not issue a tax receipt to organizations.